Breathe new life into your weathered jewellery with our Bespoke Restore service. Be it a broken stone, or metal that has come undone, we find creative ways to restore your precious pieces. We all have pieces that we love dearly, especially when they carry deeper meanings. 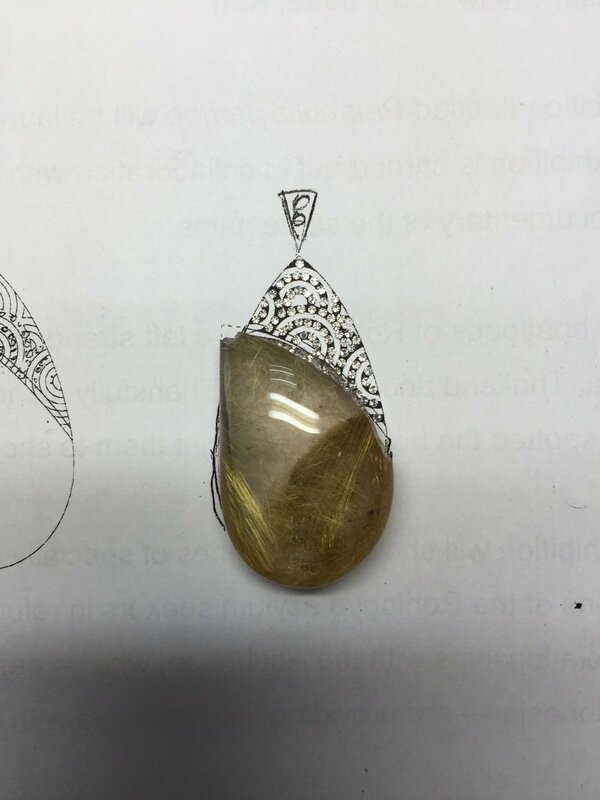 This client came to us with a damaged rutilated quartz, and wanted it reset into a pendant she could wear during events. She also shared with us that aside from its sentimental value, the stone also bore symbolism in Feng Shui. Our designer worked to conceal the crack of the stone within her design. We noticed that the client was also attached to the form of the stone, so we wanted to respect that and kept the original shape intact. The design struck a balance between the traditional yet contemporary, keeping in mind the stone’s roots in Feng Shui. The damaged parts of the rutilated quartz were bolstered by a caged wave motif and were further embellished by diamonds. Breathing new life into meaningful pieces is something we are always passionate to be involved with. When a client came to us with a pair of sentimental earrings, that had unfortunately broken, we were keen to create a fitting piece for her, while preserving the emotion attached to it. This piece was made with meticulous attention, allowing the moonstone to take center stage. A simple bezel-setting was used for these wire earrings to enable the unmistakable iridescence of moonstone. They were especially made for everyday, effortless wear, so the wearer could always keep it close to her.